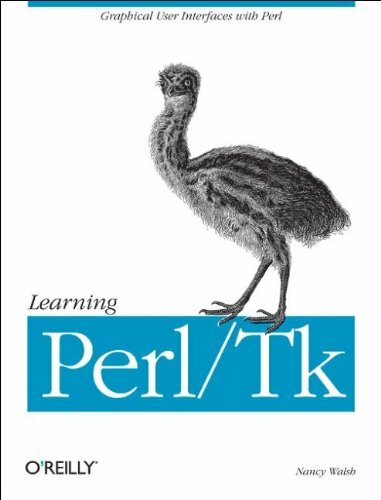 Learning Perl/Tk is a tutorial for Perl/Tk, the extension to Perl for creating graphical user interfaces. With Tk, Perl programs can be window-based rather than command-line based, with buttons, entry fields, listboxes, menus, and scrollbars. Originally developed for the Tcl language, the Perl port of the Tk toolkit liberates Perl programmers from the world of command-line options, STDIN, and STDOUT, allowing them to build graphical, event-driven applications for both Windows and UNIX.This book is aimed at Perl novices and experts alike. It explains the reasoning behind event-driven applications and drills in guidelines on how to best design graphical applications. It teaches how to implement and configure each of the Perl/Tk graphical elements step-by-step. Special attention is given to the geometry managers, which are needed to position each button, menu, label and listbox in the window frame.Although this book does not teach basic Perl, anyone who has written even the simplest Perl program should be able to learn Tk from this book. The writing is breezy and informal, and gets right to the point of what you need to know and why. The book is rife with illustrations that demonstrate how each element is drawn and how its configuration options affect its presentation.Learning Perl/Tk is for every Perl programmer who would like to implement simple, easy-to-use graphical interfaces. About: An illustrated tutorial shows how to use Perl/Tk to build graphical, event-driven applications for both Windows and UNIX and teaches how to implement and configure each Perl/Tk graphical element.